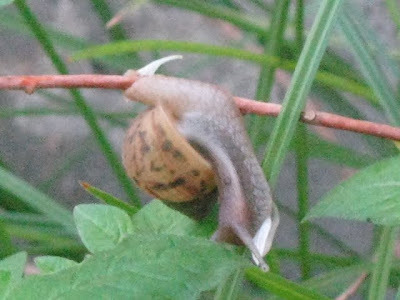 Snails are interesting creatures... Did you know that they are herbivores? Well, last week, we were waiting for Samhith's school bus when we saw this one eating up a flower. We were curious about how long it would take, and photographed it..... It took less than 5 minutes for the small creature to finish it off! It has been pouring here since the last couple of days, and Samhith is looking forward to seeing more snails. They are, after all, interesting, aren't they????? Anu, that slide show was a wonderful way to present the snail eating the flower! 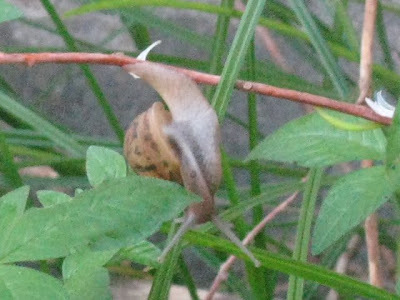 i had a garden at my grandma place but never watched snail eating flowers! thanks for the slide show and wonderful thought! yes indeed they are interesting! Snails are indeed very interesting creatures, and quite beautiful if we have that eye. I've never seen any snail eat anything, in my life! I can't believe myself. Which means they might actually consume quicker than they move! Nice takes.